We’d love your help. Let us know what’s wrong with this preview of The Territory by Sarah Govett. To ask other readers questions about The Territory, please sign up. Is this a standalone or will it be a trilogy? Sarah Govett I'm writing the second book at the moment - should be out next year! what age rating is it? A quick little dystopian read I really enjoyed. Full review to come! Having interviewed Sarah Govett on a panel a couple of years ago, I know that this series has its very loyal following and I figured it was time to give it a try. Being British it always helps to read dystopian novels that are set here as it aids in the mental world building, however I don't think it specified where on the remaining land it's based, so I missed out on picturing the characters with accents and the rest of the package. In a nutshell, the polar ice caps have melted, leaving much of Having interviewed Sarah Govett on a panel a couple of years ago, I know that this series has its very loyal following and I figured it was time to give it a try. In a nutshell, the polar ice caps have melted, leaving much of the world underwater. For small islands like GB that means very little dry land, so at the age of 15 every teenager must sit a test to determine whether they're smart enough to stay in the Territory (and become scientists or big thinkers to future the society) or will be sent out to the Wetlands to almost certain death with all the mosquitos, malaria and criminals. Rich people give their kids upgrades so they can plug in and upload the data directly to their brains, so it's not entirely a fair system between classes either. Sort of the opposite of the film Idiocracy. Good luck getting someone with a doctorate to empty your bins. The main character Noa is likeable in an annoying teenager kind of way, but she's definitely smart - if still a bit too naive by the end of book 1. Best friends Daisy and Jack I could take or leave; Daisy not being that big of a player despite having Best Friend status, and Jack being a hot-headed neanderthal a great deal of the time. The love interest is an interesting dude, I probably liked him as an actual person the most out of everyone. Finished this book a few days ago!! First I would say I don't normally read dystopian books but the story is intriguing and kept my interest. Noa Blake, the protagonist, she was a normal teenage girl. Noa is facing her end of term examinations, she's studying as much as she can, because she doesn't want to fail it, but if she fails she'll be banished to the Wetlands, where resources are scarce and death is certain. The pressure is slowly building when the exam date is coming closer. Noa and her Finished this book a few days ago!! First I would say I don't normally read dystopian books but the story is intriguing and kept my interest. Noa Blake, the protagonist, she was a normal teenage girl. Noa is facing her end of term examinations, she's studying as much as she can, because she doesn't want to fail it, but if she fails she'll be banished to the Wetlands, where resources are scarce and death is certain. The pressure is slowly building when the exam date is coming closer. Noa and her friends are struggling to survive in a world that becomes more and more insensitive. I adore the characters and world. I have been provided with a copy of the book and payment by the author in exchange for an honest review. This has not changed my review in any way. I started this book thinking it might take me a while to get into. Thinking it might be a little young and not something I'd usually read. But soon enough, I was picking this book up whenever I had a spare minute just to find out what was happening next. Rather than this book being in chapters, it had a break every couple of pages and I loved that. It meant that I didn't have to committ myself to sitting down and finishing 20+ pages, and that I could literally read this book whenever. And that's one of the reasons I finished this one in under 2 days! I also found the writing utterly captivating. Although this book read as though it would suit young teens, I still enjoyed it immensely. Because of this, the book was only 200 pages long and very easy to read, which I loved! I adored the characters and world. The world had just enough relating to Earth as we know it to ensure I could picture everything clearly, but enough differences to make it stand completely on it's own as something unique. And this book is just that - unique. Noa lives in a difficult, dangerous and terrifying world and I felt I could really relate to her feelings. Her thoughts shone through incredibly in the writing and I felt her emotions clearly. Noa isn't the only character I loved - this book actually has some really great side characters. I felt close to Noa's friends and family and I felt everything they went through right along with them. Overall, The Territory is intense, emotional and unique. It left me with tears in my eyes, and now I'm absolutely hooked and can't wait to continue with the story! I would highly recommend this book for teens aged 12-16 and are readers of dystopia. I really liked this one - intelligent dystopia with a believable premise and likeable characters and an excellent quick read. This book is about an average teenage girl and also the struggles she will face in modern society even though it is set in 2059. This is more a sci-fi book as it shows the power of robot brains. This book also has modern and historical links, such as having to have rations but still having th I received the book for free through Goodreads First Reads. This book is about an average teenage girl and also the struggles she will face in modern society even though it is set in 2059. This is more a sci-fi book as it shows the power of robot brains. This book also has modern and historical links, such as having to have rations but still having things we have such as buses. This book will have me waiting for books 2 and 3. This book will also make you wonder what would happen if this happened to us and the quote 'limited space requires limited number' will surely be the tagline of a future box office hit. This book will leave you wanting more. After my student read this book I decided to give it a go myself. For me it doesn't have huge crossover appeal but I think kids would enjoy it and get some good messages out of it re:education etc. 1 star- deeper meaning and the exam stress was portrayed so well, and I just had the SAT this June so RELEVANT! 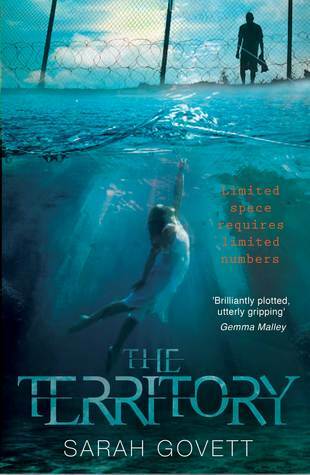 The Territory is first in a series of three books by Sarah Govett. It is 2059 in the UK, most of the country is underwater so space is limited. Only the smartest get to stay dry. The rest are sent off to live in the wetlands where disease and crime are rife and survival is slim. Noa Blake is preparing to take her exams. She is smart but that's because she studies extra hard and has the advantage of parents who can afford to send her to a good school. She is however still at a disadvantage. She is The Territory is first in a series of three books by Sarah Govett. Noa Blake is preparing to take her exams. She is smart but that's because she studies extra hard and has the advantage of parents who can afford to send her to a good school. She is however still at a disadvantage. She is a norm. She doesn't have a node, a port in her neck that allows her to upload information straight to her brain. Noa has to study the old fashioned way. Will her hard work and determination be enough to keep her on dry land? The story is told from Noa's perspective. I felt that the author captured the language of a 15 year old brilliantly. Teens do love their slang terms and there were plenty of those! I loved that Noa, like most 15 year olds, felt she was grown up, felt she was ready to take control of her own life and make her own decisions. As an outsider looking in we see Noa is still developing her sense of self, she is experiencing her first taste of love and trying to live as normally as she can in this harsh world, but most importantly, she still has so much to learn. Which is what makes this book so frightening... a 15 year old is not old enough to be sent away to live in such dangerous conditions, alone!! I would have liked to get to know some of Noas friends a little better. Daisy is Noas best friend but I didn't feel a connection to her. Jack, Noas other best friend had a habit of punching walls or lashing out when things didn't go as planned which no one seemed to address until it was too late. But then again, why in a world where 15 years olds are coldy sent to die would someone be the slightest bit concerned about something as minor as anger issues and the reasons behind it? And then there's Raf, the mysterious new boy. He was my favourite of Noas friends. He was edgy and pushed the boundries but had a kind heart. The story takes a few dark turns here and there, particularly on the subject of medical experimentation and basic human rights. Prioritisation means that medication is no longer available to the wetlands. How are new medicines tested? Certainly not on the intelligent Territory folk, that's for sure. While in the book the situation is more more severe than in real life it made me think of medicines in todays world. A persons postcode can determine how quickly they are treated. A persons bank balance can determine whether they get the best treatment available.. or not. And then there's the touchy subject of how the medicines are tested. If they are not tested on humans and animals, how will we ever know if they work but what about the humans and animals that are made to suffer so that we don't have to?? This book was one of my favourite YA reads of 2018. It was exciting, heartbreaking and thought provoking. I can't wait to pick up books 2 and 3 to see what becomes of Noa and her friends. Thank you to Sarah Govett for sending me this copy for review. Noa Blake tells the story of her last year in education in Britain.. in 2059! A flooded, yet still overpopulated world with limited resources - In what's left of Britain (The Territory) it is decided that anyone that fails the final exams at 15/16 will be shipped off to the Wetlands! Having Noa narrate the story from a first person Point Of View works really well, the dialogue of thinking, feeling and talking like a 15 year old is executed magnificently by Govett; as the darkness and unfairness Noa Blake tells the story of her last year in education in Britain.. in 2059! 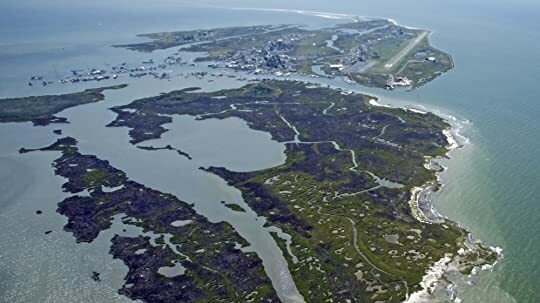 A flooded, yet still overpopulated world with limited resources - In what's left of Britain (The Territory) it is decided that anyone that fails the final exams at 15/16 will be shipped off to the Wetlands! Having Noa narrate the story from a first person Point Of View works really well, the dialogue of thinking, feeling and talking like a 15 year old is executed magnificently by Govett; as the darkness and unfairness of this world is revealed slowly, sometimes just randomly, as it would by someone living there all their lives. A thought provoking and captivating read that sees Govett create an entire new and absorbing reality, as well as a multi faceted and complex (i.e 'real') female protagonist; and to top it all off, raises issues like authoritarianism for the better good, wants and needs, elitism, complicity, secrets and lies for the better good? etc. The territory was a decent YA dystopia, but I had some issues wihh the way it was written. The beginning of the book hits you with a lot of slang terms early on, and because if the teen (slightly annoying) voice, these all blurred into one for me. But they were actually terms I needed to know about the hierarchy of society, as they were introduced so quickly and not always explained I didn't keep up. Also without chapters it felt a little stream of consciousness-esque. Also because each section i The territory was a decent YA dystopia, but I had some issues wihh the way it was written. The beginning of the book hits you with a lot of slang terms early on, and because if the teen (slightly annoying) voice, these all blurred into one for me. But they were actually terms I needed to know about the hierarchy of society, as they were introduced so quickly and not always explained I didn't keep up. This review has been hidden because it contains spoilers. To view it, click here. I really enjoyed reading this book! Although, like most dystopian novels, it's a sort of familiar theming to it it's still brilliant! I'm gutted with what happened to Daisy, although whatever direction they went in with her character she was always going to end up down a horrible path anyway. I'm gutted about Jack but at the same time I feel like he needs to stop acting like such a cry baby all the time. Running off like that towards the end and then ending up in the wetlands for desertion anyway I really enjoyed reading this book! Although, like most dystopian novels, it's a sort of familiar theming to it it's still brilliant! A very quick and easy read. There were a few bits in the beginning that had me thinking “oh no I’m not too sure now” but I quickly worked it about was able to get past it. The book does read like a 15 year old is narrating it so it’s on point there-and you do find yourself holding a breath at the end. The story flowed very well and wasn’t broken at all. I look forward to seeing what happens next. All in all a very good read! I loved the story line of this book I was just a little put off by the constant use of teenage slang. I still have no idea what "malc" is. However the build up to the exam was tense and brilliant and the comment on the modern education system was very apt. It was a thrilling read and I look forward to discovering exactly what goes on in the dreaded Wetlands in the sequel. A good idea and well-executed but doesn't shine out for me as anything special in the YA world. Dystopian romances are often predictable, and even though this book left us with a great cliff-hanger it was just another dystopian romance. Just as a little side note, I am 15 years old and- like Noa- I also have exams looming. I've been reading way too much and not revising- I should fix that. This book has been relatable but terrifying at the same time. I found myself wanting to put the book down so I could revise but, at the same time, fighting with myself because this book was so good! Sorry, I should've mentioned at the beginning what I thought about this book! Well I'm mentioning it now! This book was absolutely fantastic, comp Just as a little side note, I am 15 years old and- like Noa- I also have exams looming. I've been reading way too much and not revising- I should fix that. This book has been relatable but terrifying at the same time. I found myself wanting to put the book down so I could revise but, at the same time, fighting with myself because this book was so good! I think the characters were my favourite part of the story. Each one was so different and they were all developed so well. Noa, for example, she was developed so well but I found some of her decisions so stupid and I was sat there screaming at my book because of her actions. I was so tempted to throw my book across the room and I would've except I love this book so so much! Another part of the reason I got angry at this book (in a good way) was Raf. I don't want to say too much because of spoilers but honestly? I hated him. But I think Sarah Govett wanted us to hate him. I can just sense something is up with him. All I'm saying is I love Jack and Noa. End of story. Let's talk about Daisy. Wow, she was a beautiful character. I loved how different all three of the friends are and that really just gave the story a lot more depth. Daisy was my favourite character after Jack. It's 2059 and a lot of what used to be land is now under water. Noa Blake is a normal teenager who's living in The Territory. Only the smartest people are allowed to live there. Rich children can download information into their brains and don't have to study. There isn't enough space for everyone to stay on land and one exam will determine the future of every teenager. If they pass they can stay and if they fail they have to go, they will be sent to the Wetlands where mosquitoes are causing horr It's 2059 and a lot of what used to be land is now under water. Noa Blake is a normal teenager who's living in The Territory. Only the smartest people are allowed to live there. Rich children can download information into their brains and don't have to study. There isn't enough space for everyone to stay on land and one exam will determine the future of every teenager. If they pass they can stay and if they fail they have to go, they will be sent to the Wetlands where mosquitoes are causing horrible diseases. The people there are being left to survive without any of the modern resources of The Territory. It's a competitive world and Noa is worrying about the exam. She's studying as much as she can, because she doesn't want to fail it. At school those who have the nodes are looking down on the students who are normal and have to study. Until Noa meets one of them who isn't like that. They instantly become very close, only Noa already has a best friend, someone who isn't willing to give her up. Noa isn't just a student, she's also a regular teenager who should be allowed to live a normal life. Unfortunately life is far from normal. The Territory is a scary world to live in. Inequality is making things difficult. Noa has a chance, she might pass the exam. Other normal teenagers aren't that lucky, they already know what their destiny will be. Noa cares for her friends, but she also has her faults. The Territory comes with many rules. There's no reading for fun, hardly any music, etc. The world has become a colder and harder place. Not everyone is going that way though and Noa and her friends are struggling to survive in a world that becomes more and more insensitive. Noa is a regular teenage girl. She isn't perfect and she makes mistakes. She might pass the exam because she's really smart. She's even smarter than most of the students who have the nodes to upload information. There's so much pressure, if she doesn't pass the exams her parents have to go with her to the Wetlands and she's dreading it. Studying is her main focus, but like every girl her age there are distractions. Falling in love for the first time can be confusing, especially when you have to choose between two guys. You might think dystopian, apocalypic futures are getting a bit overdone in YA fiction (and you might be right), but this was fresh and wonderful. Sarah Govett built a convincing post-apocalyptic world and I was hooked from page one (literally – I’d downloaded the sample and I think I abandoned it at page 3 to buy the complete book), and I then raced through it during a long train journey. Think you’ve experienced exam stress? How about exams when your life literally depends on your results? That You might think dystopian, apocalypic futures are getting a bit overdone in YA fiction (and you might be right), but this was fresh and wonderful. Sarah Govett built a convincing post-apocalyptic world and I was hooked from page one (literally – I’d downloaded the sample and I think I abandoned it at page 3 to buy the complete book), and I then raced through it during a long train journey. Think you’ve experienced exam stress? How about exams when your life literally depends on your results? That’s the premise of The Territory and it was brilliantly executed. What I especially liked in The Territory was the way I felt I was seeing the start of a totalitarian regime. In many YA dystopias the “oppressive government” is a bit of a cliche – there for no reason other than to be oppressive so the characters have something to rebel against. By contrast, in The Territory the pressure was real – not enough resources for the population means hard decisions had to be made. I could see that the people in charge making decisions weren’t mwah-ha-ha evil villains, they were just selfish or ignorant or stupid – which is far more chilling. And we had a brilliant cast of characters struggling to survive in this harsh world. I loved them all (and cried for a couple of them, you’ll know who if you read it…). Noa was wonderful, struggling with real life, school and boys as well as starting to come to terms with the reality of the territory. Three stars is probably quite harsh, 3.5 is probably more appropriate really. Noa Blake lives in Britain, but this island isn't the Britain we all know and love. Due to global warming the seas have risen and much of Britain is under water, and the resulting Wetlands are certain death, full of disease and killer mosquitos. With resources at a minimum, a special exam was introduced whereby all 15 year olds are tested to see if they are worthy of staying in Britain and using resources. Those who fa Three stars is probably quite harsh, 3.5 is probably more appropriate really. Noa Blake lives in Britain, but this island isn't the Britain we all know and love. Due to global warming the seas have risen and much of Britain is under water, and the resulting Wetlands are certain death, full of disease and killer mosquitos. With resources at a minimum, a special exam was introduced whereby all 15 year olds are tested to see if they are worthy of staying in Britain and using resources. Those who fail the difficult test are turfed out into the Wetlands to fend for themselves. But in this era of modern technology, those who are well off can implant a special technology into their children, which although turns them into snobby, brainwashed zombies, it does render them able to learn (upload) by rote and therefore survive. Noa is a norm, forced to rely on her own brain power. We follow Noa, plus her friends Daisy and Jack as they try to survive this cruel world and learn the real truth about The Territory. School exams are stressful and can change your life but none are as stressful or life-changing as the ones 15-year-old teenagers have to undergo in Sarah Govett's The Territory. It's the year 2059 and the water levels are rising causing a severe lack of land to live in and, therefore, making people who don't pass the exam to be sentenced to live in the Wetlands (a dangerous place filled with deadly diseases and no medical facilities), and not able to return to safety because of the high electric fences surrounding it. Noa Blake is one of the many teens taking the exam and, in this first book, we see how she deals with everything (friends, family, boys and the crazy amount of studying). However, to make things worse and more unfair, the richest kids can have a surgical implant that allows them to 'download' information into their brains without having to study. The Territory is a great book in the way that it criticises the educational system because even now the richest families can afford to enrol their children in better schools and have tutors while the less rich are obligated to accept the conditions their schools have. It also raises awareness for climate change and global warming, issues that are of utmost importance today. The author created a very rich world and plot and I can't wait for the sequel! The Territory was an interesting read which really explores a lot of thought provoking subjects. Like how far can a government go before anyone will truly oppose it? When there just isn't enough to go around, what's really the fairest way to decide who deserves it? In The territory where Noa lives all children are tested at the age of fifteen and only the ones who pass are considered smart enough to be a credit to society and can stay. The kids that fail are sent out into the wetlands, which eve The Territory was an interesting read which really explores a lot of thought provoking subjects. Like how far can a government go before anyone will truly oppose it? When there just isn't enough to go around, what's really the fairest way to decide who deserves it? In The territory where Noa lives all children are tested at the age of fifteen and only the ones who pass are considered smart enough to be a credit to society and can stay. The kids that fail are sent out into the wetlands, which everyone knows is pretty much a death sentence. First of all, just imagine the stress of that for a fifteen year old, one test will literally determine your future, It really plays on the reality of the pressure that is put on kids to do well in school. While The territory had an interesting subject and an obviously well thought out setting, I think I would've enjoyed it more if Noa had been slightly more grown up. I did like Noa for the most part, but sometimes she can be a typical immature fifteen year old, however she's not stupid, she sees and understands more than the adults in her life realise. I liked that she asked a lot of questions about how things are run and had her ideas of what would be better, she's actually very clever. As the story goes on, it becomes more intense and there's some shocks in there too, by the end, I wasn't sure what was going to happen. Noa Blake lives in a dystopian world where kids have to take a test to determine if they live in the Wetlands where survival is almost non-existent. She has two best friends Jack and Daisy who are Norms like her. If a family is wealthy, they can 'upgrade' their kids to be a Childe where the chances of going to the Wetlands is unlikely. Noa is generally a smart girl so she has a possible chance of passing the test. She helps out her friend Jack with studying. She is like any high school kid but sh Noa Blake lives in a dystopian world where kids have to take a test to determine if they live in the Wetlands where survival is almost non-existent. She has two best friends Jack and Daisy who are Norms like her. If a family is wealthy, they can 'upgrade' their kids to be a Childe where the chances of going to the Wetlands is unlikely. Noa is generally a smart girl so she has a possible chance of passing the test. She helps out her friend Jack with studying. She is like any high school kid but she is caught in this strange world where her life is depended on her ability to pass a test. Noa meets Raf, a Childe who is different from other Childes. He doesn't make fun of Norms. He is more human-like and Noa takes a liking towards Raf who has different coloured eyes. Something unfortunate happens and things start looking bad for Noa. She also finds out the truth about what her mother does. Her mother works for the Ministry and is seen as a 'good guy' but something happens that make Noa question that.